The wonderful Tina McCarthy from Wheel Women recently visited Sydney and ran a bike skills course and asked me along on the Sunday morning. It was great interacting with a great group of female cyclists. 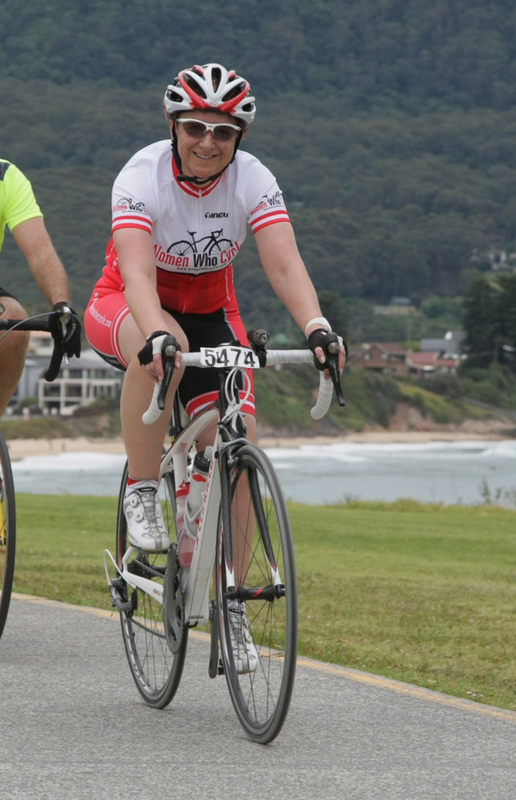 One of the questions I was asked was “Have you got any tips for riding the Gong ride?” and I most certainly do. Don’t procrastinate any longer. If you enter the event you’ve made a commitment to yourself and to others. If you put it off until you get closer to the date you’ll continue to make excuses. You’ll also find that rides like the Gong ride have a restriction of entry numbers and may sell out. 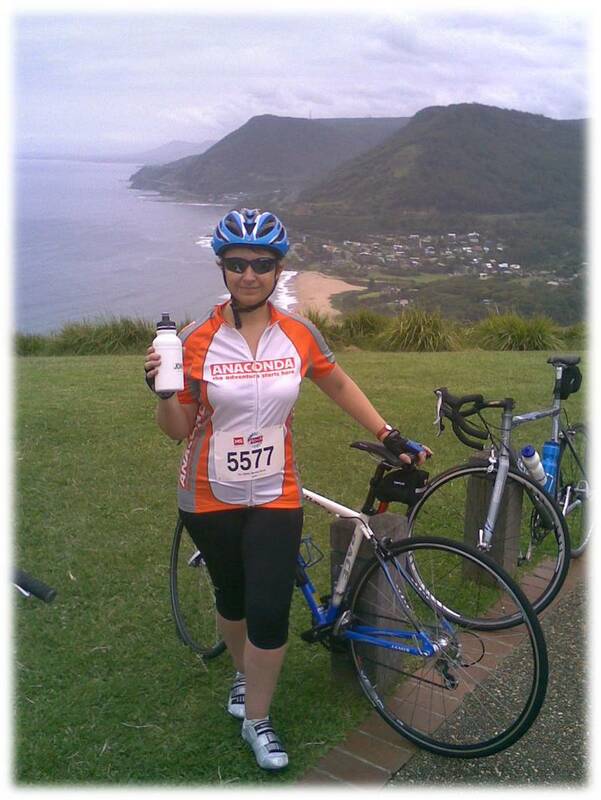 My Gong Ride 2013 – looking a little more relaxed and colour coordinated! Like many mass participation rides, the Gong ride has a chosen charity and in this case it’s the MS Society. Everyone who enters is encouraged to raise some money. Your entry fee covers the costs associated with running the event, any money you raise over that entry fee amount goes to the MS Society. Ask around and find some riders of similar ability who would like to join you on the ride. It is also great to have some training partners. You need to start training at least a few months before the ride so you can build up your endurance. The Gong ride is 90 km (it’s really 85 km) and there’s also a 58 km option which is what I did in my first year. So when you are training, gradually increase your rides over the weeks, and try to ride two or three times per week rather than just one long ride. Call your local bike shop and book your bike in to be serviced at least one month before the event. While you are visiting the shop ask the staff for some advice about what emergency supplies you need to carry with you like a spare tube, tyre levers and pump. Make sure you have comfortable riding apparel which may include lycra clothing and definitely should include cycling shorts/knicks with good quality chamois. It’s also important to have a decent bike to ride in a long event. The best bike for this type of event is a road bike but you could also complete the ride on a flat bar road bike, a hybrid or even a mountain bike with smooth tyres fitted. But if you want to really enjoy it then a road bike is the only way to go (I’m a little biased). Make sure you eat well leading up to the event and on the day. Carry two full drink bottles and take food with you in your pockets but also take advantage of the complimentary muffin which is given out at the Loftus rest stop. The night before you should get all your gear ready, ensure you bike tyres are pumped up and your number is attached to your bike. Even lay out your clothes, drink bottle and food so you don’t have to think about it in the early hours of the morning. I confess that I get really nervous just before a big ride, but I always find that as soon as I am riding I feel ok, so I just push through the bad feelings knowing that I’ll be ok. So my biggest piece of advice is to enjoy yourself, take in the lovely surroundings and pedal at your own pace. You should keep to the left so faster riders can overtake safely and when you overtake others also do it on their right, and trust me there will always be someone slower than you. Go at your own pace and make sure you stop as much as you need to. There are four or more rest stops so take advantage of these, and have a rest, go to the toilet or visit the friendly volunteer bike mechanics at each location. Hi! Just found your blog, thank you for writing it, it really helps me out a lot! Planning to cycle across the world next year and I love finding other bike crazy females out there 🙂 Will definitely be going through a lot of your old posts!